1. Combine garlic and oil in a pot. Saute' until light golden brown. Add ginger, onion, tomatoes and siling panigang and saute' for 2 minutes. 2. Add salmon belly, gently stir and cook for 2minutes. Pour rice washing or water, bring to boil, skim the scum and simmer for 2 minutes. Add sitaw and simmer for 1 minute. 3. 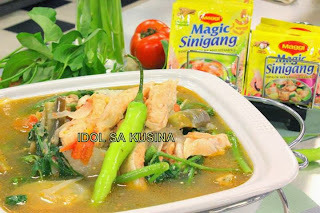 Pour MAGGI MAGIC SINIGANG Original Sampalok Mix. Stir in kangkong and remove from the heat. Transfer into a serving bowl and serve hot.